I had a fantastic studio shoot with Derek. 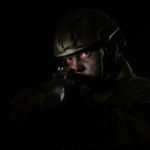 He is a great guy who loves to play airsoft games. 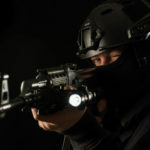 Airsoft is a real time game in which participants play ‘videogame like’ shooting games with ‘weapons’ that shoot small plastic balls which are called BB’s. These weapons look like real guns but of course they are not. That’s why the airsofters call them replica’s. 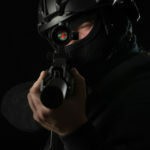 Playing airsoft games is a bit like paintball but much more realistic. Very cool. So Derek and I did a studio shoot with some different outfits and a variation of his replica’s. 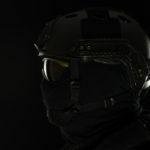 The goal was to create some dark, moody, and above all, cool images. Here are some of the results. In this shoot I mainly used studio studio strobes with striplights. In some images I used a gridded snoot in order to focus the light even more on the face. Thank you Derek for this great shoot. We had a lot of fun.